I have a T-shirt thief in my house; my T-shirts have become her pajamas and I only get to see my old friends as I do the laundry. However, I have a clever plan to foil this T-Shirt thief. Well, more like limit the shirts she decides to use. I have a decoy drawer of shirts! To give you a little history of men and their love for T-Shirts, I have two drawers of T-shirts (Tee Shirts). Why two drawers? I have two drawers because everyone knows men NEVER throw their T-shirts away. Unlike my worthless advice, my T-shirts never become worthless. If a man does get rid of a T-shirt, it is clearly a mistake or an accidental lapse of sanity. Who isn’t insane with your T-shirt collection is in consent danger of being stolen? Keeping that in mind, I put all of my least favorite shirts in the top drawer and move my nicer shirts to the bottom drawer. We won’t talk about the other stack of T-Shirts in my closet; those are back up T-Shirts and we don’t need to talk about those. Then there is the guest closet with the T-shirts that I only wear during the winter months because clearly they are used underneath my sweaters. Those T-shirts aren’t allowed to mingle with the summer T-shirts. Everyone knows Summer T-shirts have sarcastic sayings so you can express your brand of humor to the world and show everyone how clever you are. Now, I have my T-Shirts in two drawers which allows the thief to use my least favorite shirts as pajamas. She ALWAYS gets the T-shirts from the top drawer, thus never accessing the bottom T-shirt drawer. So the good T-shirts go in the bottom drawer. She gets to use some of my T-Shirts and I get to keep my favorites hidden away in a safe location. It’s a fair deal, right? Organizational Tip: Instead of stacking your T-shirts one on top of another, put them sideways in your drawer. 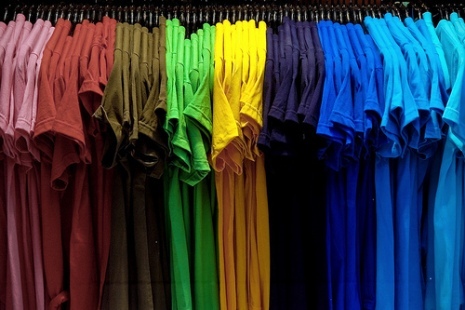 This way you can see the different colors of shirts quickly. Another Tip: Always organize your shirt drawer by color. All the red shirts go together, blues, greens, etc. I think I failed to make this a worthless advice blog post with those two awesome tips. Oh well….